Sponsorship banners abound at the French Lick Springs Hotel as Legends Championship closes in. FRENCH LICK, Ind. — The Ladies PGA Tour took two weeks off from tournaments to avoid conflict with the Olympic Games in Brazil, and the men’s PGA Tour greatly revised its schedule during that time period. That wasn’t the case with The Legends Tour, the official senior circuit of the LPGA. 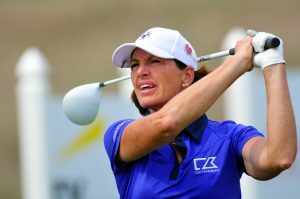 Its biggest tournament of the season for players in the 45-plus age group was scheduled for Saturday and Sunday, directly opposite the final two days of the women’s competition in Rio de Janiero. The fourth annual Legends Championship, a 36-hole event with a $75,000 purse, will be played on the stunning Pete Dye Course at French Lick Resort. Jane Blalock, who created the Legends Tour in 2000 when her own great playing career was winding down, has no regrets about the scheduling opposite the Olympics. While hardly the magnitude of the Olympics, The Legends Championship has its appealing qualities. Juli Inkster hopes to become the first repeat champion at the Legends tourney. If anything, the arrival of the Olympics only makes the Legends’ stars envious of what they missed during their peak playing years. There wasn’t much international team play then. She sees the Olympics giving golf a need boost that will carry over for years to come. Legends players just practiced on the Pete Dye Course on Thursday before the action begins. They’ll get even more excited, she expects, if the U.S. women perform well. The women stars of today supported the Olympics much better than their male counterparts, as many of the latter bypassed the Games citing concerns over the Zika virus. Blalock downplays that. Signage on the Pete Dye Course is notably different than that at the French Lick Springs Hotel. As for The Legends Championship, it’s become a feature in this southern Indiana town that was once made famous as the home of basketball great Larry Bird. Golf has always been big here, too, however. Walter Hagen started his storied run of four straight PGA Championships on what is now the Donald Ross Course, sister course to the Pete Dye Course where the Legends play. The Ross Course also hosted the 1959 and 1960 LPGA Championship, won by Betsy Rawls and Mickey Wright. Inkster, already a legend off her playing record, is the defending champion in The Legends Championship. She won the title in her first tournament on the 45-and-older circuit. The first two stagings were won by Lorie Kane in 2013 and Laurie Rinker in 2014. The most eye-catch feat in the history of the event, though, may have been the 63 shot by Sherri Steinhauer in the rain-shortened tourney of two years ago. 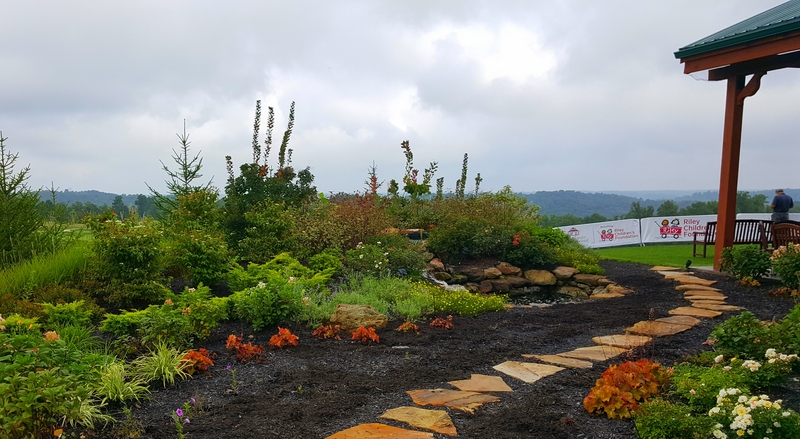 Legends fans will enjoy the new garden behind the expanded Pavilion at the Pete Dye Course. Kane has been the hottest player on the circuit this year, winning the last two tournaments – the Chico’s Patty Berg Memorial in Florida and the Self Regional Women’s Classic in South Carolina. Both were 18-hole events. The Legends Championship also features a seven-player Honors Division, for stars 63 and over. Jan Stephenson won last year and will be going for her fourth straight title in the tour’s Honors division events. One of the circuit’s top players was a late withdrawal from The Legends Championship. Liselotte Neumann returned to her native Sweden this week after learning of the death of her mother. In addition to the action on the Pete Dye Course a highlight of the festivities will be the induction of Sandra Hayne and Elaine Crosby into the Legends Hall of Fame on Friday night. The Legends’ Hall is located at the near West Baden Springs Hotel near the Pete Dye Course.